British concert-goers mostly know Roderick Williams as one of our finest baritones, but it turns out he’s a composer too and, as far as I can tell, this is the first disc to be devoted entirely to his own music. It’s a lovely selection: warm, inviting, tonal and smooth, and it’s to be recommended. The most impressive thing about the disc is the compositional variety of what is on offer. Williams takes us from a warm, Chilcott/Rutterish sort of sound world, into something that’s quite exploratory and meandering, but he never goes beyond the tonal, and that makes his music appealing from the outset. Take, for example, the opening track, Let Nothing Trouble You, which uses a mixture of solo and vocal textures to mirror the text’s words of reassurance about the unchanging nature of God. The vocal texture is simple and mostly undivided, reiterating the text’s warmth and intimacy of spirit in a most appealing way, and the rocking motion of the final moments is beautifully comforting. There is a lovely singability to this and to lots of other tracks on the disc, suggesting that Williams is capable of writing for both the polished professional and the committed amateur, something you’ll also hear in his lovely setting of the Lord’s Prayer. O Guiding Night is a dynamic and exciting piece where a vigorous and pictorial piano line mirrors the changing sentiment of the choir as they sing Juan de Yepes y Alvarez’s words about his search for God. Coming straight after the a capella textures of Let Nothing Trouble You, it’s quite a leap but it summarises the variety on offer on the disc. The familiar text of Longfellow’s Christmas Bells is given a setting that alternates between blithe merriment and introverted contemplation, and I really liked the thoughtfulness of the setting from Isaiah Chapter 11 (track 4). Love bade me welcome abandons strophic structure for a diverse form driven by the spirit of the text. On the opposite end of the spectrum is the lively, dance-like spiritual settings of both Children go where I send thee and Mary had a baby, which you can completely imagine being done in church; while Charles Baudelaire’s Hymne is set with a richly fragrant harmonic texture that mirrors the European fin-de-siècle. Williams does an impressive amount with a very small text in Quare fremuerunt gentes (Why do the Gentiles rage, from Psalm 2), using lots of little musical flicks and ticks to suggest the futility and irritability of the gentiles’ raging. He also conjures up a sound of ethereal beauty in O Adonai, and in his reimaging of Ave Verum, which takes Byrd’s famous setting as a starting point and extends the note values to create eerie echo effects and hanging suspensions that will tingle your ears. You may have already heard this on ORA’s Byrd-inspired disc of 2016 (review). Likewise, This is the Work of Christ has an appealing directness to it that makes it a lovely way to end the disc. 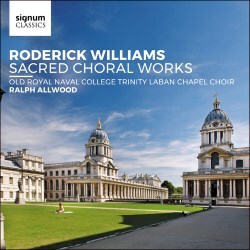 As with Williams’ compositions, I had never previously come across the Old Royal Naval College Trinity Laban Chapel Choir, but they acquit themselves very well. The sopranos sing with crystalline clarity throughout (listen, for a good example, to the opening of O Saviour of the World) and the basses consistently give a richly satisfying underpinning. The acoustic of the chapel of the Old Royal Naval College sometimes makes the piano feel a little drowned, but otherwise the Signum engineers do an excellent job of capturing it, and there is ample space around the sound. Director Ralph Allwood was, apparently, the motivating genius behind the whole project in the first place, and his commitment to both the music and the performers is never in doubt, giving conviction and dedication to every phrase. This is definitely worth exploring, therefore, and those who are already Williams’ admirers on the stage will find that there’s a whole new side of him to admire here.